A description of a new method of propelling locomotive machines, and of communicating power and motion to all other kinds of machinery. Written during the great period of steam carriage development, this rare little work describes a mechanical road vehicle, but one propelled by compressed air rather than steam. Mann’s patent, which he took out in 1829, hinged on the storage of the air in portable containers topped up by condensing pumps and reservoirs stationed every 15 or 20 miles along the roads. Mann goes on to explore other possibilities of the concept, for instance the supplying of manufacturing towns with compressed air brought in by pipe-line. 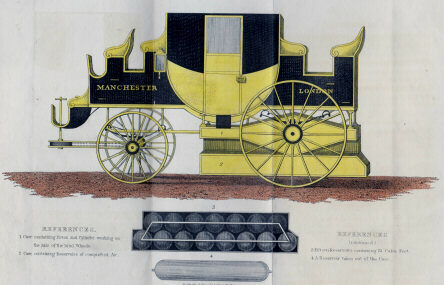 The book is illustrated by a splendid colour plate of a handsome carriage painted in black and yellow, showing the position of the driving gear and the case holding the vessels of compressed air. 8vo. 56pp, folding engraved frontis, hand coloured. Orig. boards.